Untitled, a photo by L. Wiggins on Flickr. A few years ago, Karl attended a class about hummingbirds. He learned about their habits and how to attract them. For example, he learned that once a hummingbird decides your feeder is a good, safe place to find food, then he’ll make it a regular stop on his migratory journey. Plus, other hummingbirds will find out. Kind of like the way you and I pick a favorite Waffle House on the way to the beach. So far this season, we have seen two different hummingbirds visiting our feeder. I hope to snap a picture of the other soon; it has a gorgeous, bright red throat. We haven’t had any humming birds yet. Likely by the end of the month we will. It’s had to get close to them; they see us coming. I’ve found that if I sit still outside long enough, they will ignore me. I sat for at least 30 minutes for that one photo. I love that! 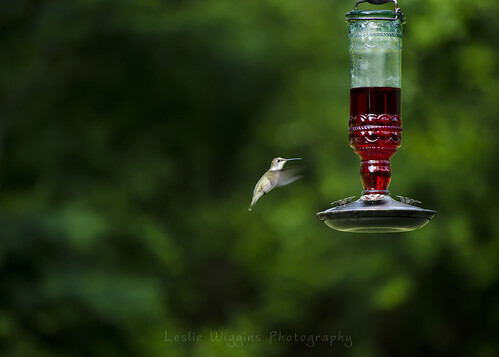 I thought about getting a hummingbird feeder this year because I’d seen another friend’s great pictures when they showed up. I thought it might be fun for the kids. Yes, my kids LOVE watching birds. We have 3 different kinds of feeders that attract a variety of birds (and squirrels). The kids have learned to recognize so many native birds and their calls over the years. It’s fun! Beautiful! It’s also a reminder to put out our feeder by the kitchen window. We’ve had hummers in the past visiting our wildflowers, but it’s more fun seeing them close than from a distance. I have a feeder that’s been in the same location for years…but I don’t get any visitors quite this early. It’s usually closer to mid July before I get alot of hummingbirds. My mom lives further south and she has birds from mid-Spring throughout summer. I love to sit on my porch and watch them! They do not like to share, that’s for sure!